Beef tastes great paired with the strong flavours of tamarind and lemongrass. This dish can be made in minutes- perfect for a speedy weekday supper. (For a more filling option try it with wholegrain noodles.) This meal is <a href=_http_/www.bbc.co.uk/food/collections/low-calorie_recipes__low.html calorie</a> and provides 232 kcal, 30g protein, 13.4g carbohydrate (of which 10.8g sugars), 6.3g fat (of which 1.7g saturates), 1.7g fibre and 0.8g salt per portion. 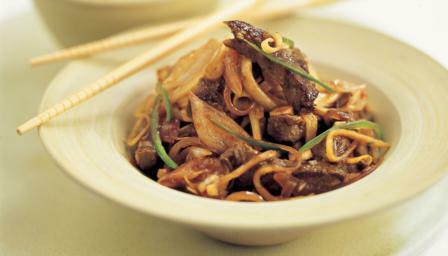 Heat the oil in a wok or frying pan, toss in the beef and cook over a high heat for 2-3 minutes. Add the lemongrass, shallots and chillies and stir-fry for a 5 minutes, or until the meat is well browned. Add the tamarind paste, lime juice, fish sauce, sugar and papaya and stir-fry for 4 minutes.